" There are some corners of the universe which have bred the most terrible things. Things which act against everything we believe in. They must be fought!" Welcome to the 150th episode of Doctor Who! 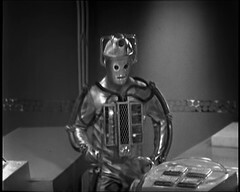 Polly enters and sees the Cyberman leaving. She screams which summons the Doctor & Hobson. 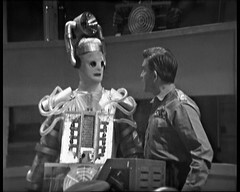 Hobson refuses to believe it's a Cyberman, he knows they were all killed when Mondas was destroyed. He gives the Doctor 24 hours too find the source of the infection. The Graviton keeps wandering off course and Hobson is called by his superiors. He wants to deactivate the Graviton to find the fault but his superiors won't let him. While the Doctor collects samples from the base Polly is knocked out by a Cyberman in the sickbay which ignores a terrified Jamie, who still believes he can see the Phantom Piper, and takes another crew member away. In control they detect another pressure drop in the base. 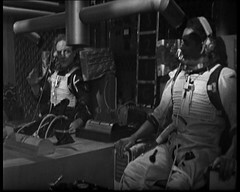 The Graviton fault is traced to some damaged equipment on the surface: Jules & Franz are sent outside to fix it but are ambushed by Cybermen. Polly makes coffee for the base staff, one of whom is instantly taken ill. 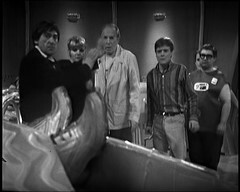 The Doctor deduces the virus is found in the sugar as only some of the crew are being taken ill. 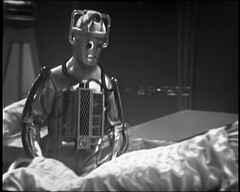 The Doctor then realises that the sickbay hasn't been searched: A Cyberman has been hiding in there on one of the beds and now stands revealed. Cracking episode that. We know the Cybermen are there but the base refuse to believe the story so the Cybermen then spend the whole episode popping up here and there abducting crew members. Yes the Cyberman hiding in Sickbay at the end is a tansy bit silly but .... I watched this episode late one night and Liz actually watched it with me. She thought it quite good but thought the start of the title looked like someone's bottom and that the cameraman was fixated on Jules & Franz's backsides as they climbed up through the airlock! HOBSON: I don't know who you are, what you are or where you come from. But you can get off the moon now. BEN: Yeah, well that suits me fine. The sooner the better. DOCTOR: No, Ben. We can't go yet. BEN: Well, why not? They don't want us here. DOCTOR: Because there is something evil here and we must stay. HOBSON: Evil? Don't be daft. DOCTOR: Evil is what I meant. There are some corners of the universe which have bred the most terrible things. Things which act against everything that we believe in. They must be fought. This disease, for instance. It isn't really a disease at all, but I can help you with it. You'll see. I'll find the cause for you. Then there's the exchange with the oh so posh Controller Ringberg, voiced by Denis McCarthy who'd been a Doctor in Quatermass II: The Destroyers. CONTROL: Earth calling Moon Weather Control. Stand by. Stand by for the controller. R/T: This is Moonbase. Come in please. CONTROL: We wish to speak to Mister Hobson. CONTROL: Stand by for the Controller. HOBSON: Right. He's actually going to speak to us this time. RINBERG: Controller Rinberg speaking. Is that you, Hobson? Very much looking down his nose at his underling here! RINBERG: The directional fields are showing a progressive error. Reports have come in of wide-spread pressure fluctuations in Atlantic zone 6. You must get the gravitron back into balance. HOBSON: We're trying to compensate by re-aligning the probe. We have an error in the servos. RINBERG: Well, there's no sign of any improvement here. We've just had a report from Miami, Florida. Thirty minutes ago they were enjoying clear skies and a heat wave. Now Hurricane Lucy is right overhead. BENOIT: There is only one thing to do. HOBSON: What, switch the gravitron off?! BENOIT: Yes, it's the only chance. HOBSON: We can't do that, man. The collapse of the gravity would devastate half the globe. There'd be storms, whirlwinds, hurricanes. RINBERG: I overheard your conversation. It's quite out of the question. You're not to shut down the gravitron under any circumstances, and that's an order. I think perhaps you don't appreciate how serious the situation already is. HOBSON: I bet he gets a knighthood. Superb aside from Hobson to his crew, demonstrating a clear them and us dimension to the relationship between the Moonbase crew and their senior management back on Earth. RINBERG: We spent years in a general assembly negotiating methods of agreement between farmers and landowners and so on. Now the weather's out of control they're after our blood, and I must say I can't blame them. You've got to get that thing under control, quickly. Now please get on with it. CONTROL: Earth control, over and out. Not once does Rinberg enquire of the health of the ill men on the moonbase! All he cares about is it keeps operating. HOBSON: Well, you're all in the picture. We've got trouble, bad trouble, we haven't got much time. We're going to run through every circuit, every field pattern, every damn nut and bolt on Charlie boy in there until he's running sweet and smooth. A full class A test, in fact. Now you all know what to do so let's get on with it. The phrase "Charlie boy" always takes me right out the episode as I had a lecturer at University, Roy Edwards AKA Mr Roy, who used this turn of phrase. A brief bit of internet research reveals it, like many pieces of slang, has a quite derogatory origin! Jamie was a last minute addition to the Tardis crew at the end of the Highlanders with subsequent scripts having to be amended to accommodate him usually with him steeling lines from one of Ben or Polly. Here he spends most of this episode asleep in sickbay. Is that to avoid having to invent new dialogue or has he appropriated Ben's role, who now has little to do in this episode, and that's the reason Polly watches over him. Have we acquired the phantom piper at the expense of loosing Ben hallucinating about Davy Jones? 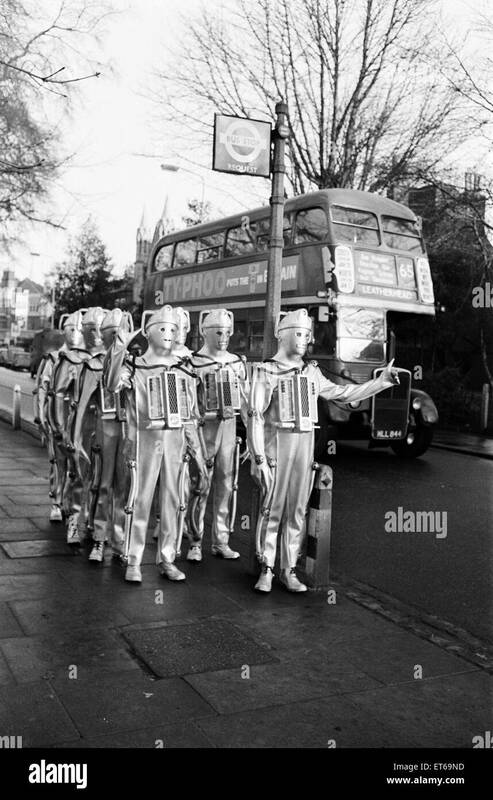 The return of the Cybermen was greeted with some publicity including a famous photoshoot of the monsters queuing at a bus stop outside Ealing studios. You can see an example of it here. These photos were still be used many years later and I can remember seeing on in a feature in the 1982 Starlord annual now awol along with all my other annuals somewhere in my Mum's house! 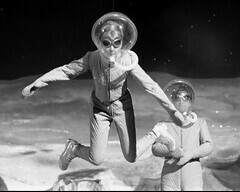 Oddly enough this story also sees the return of Spacesuits to Doctor Who, something last seen in the Cybermen's first appearance, The Tenth Planet. 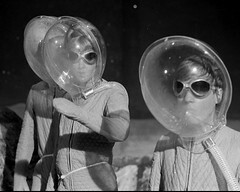 The outfits used by the Moonbase crew here are nowhere near as good as those seen in the Tenth Planet. 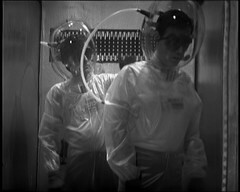 There does seem to have been a mix up with the suits: That's Jules and Franz in the airlock but whoever's to the rear, Franz I think, appears to be wearing the spacesuit for number 4, Doctor Evans! And as bad as the Moonbase spacesuits are they're better looking than the quilted ones used by the Tardis crew in the first episode.